Posted by VU Managerial on Wednesday, February 22, 2017 in News. 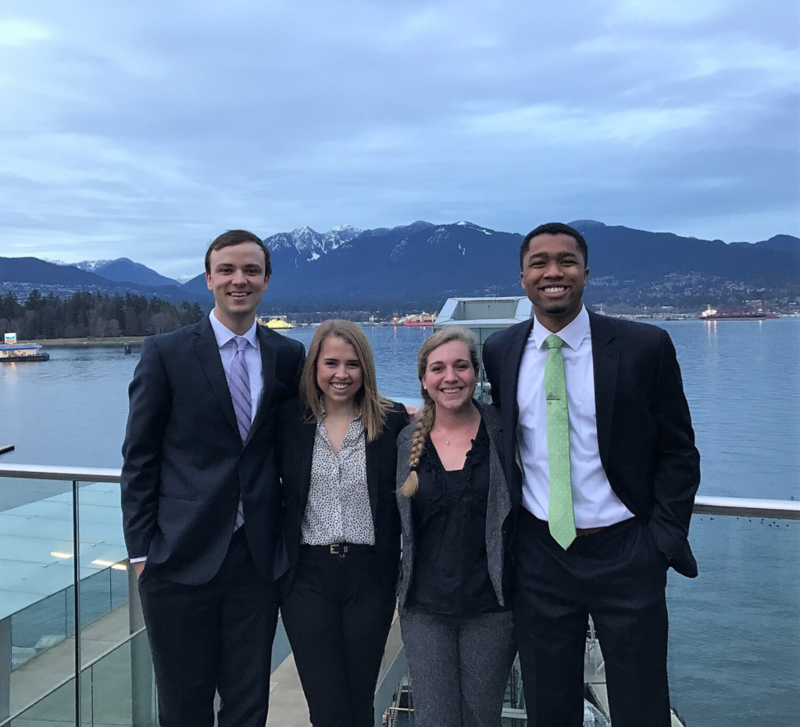 Last weekend, four Vanderbilt seniors competed in the National Strategy Consulting Competition (NSCC) with support from the Managerial Studies Department: Katy Leinweber (Peabody College), James Macey (School of Engineering), Michael McMillan (College of Arts and Science), and Victoria Potter (School of Engineering). NSCC is a business case competition and conference organized by students at the University of British Columbia. This year, the event hosted competitors and attendees from Canada, Europe, and the United States in Vancouver, Canada. The members of the Vanderbilt team, known as the “Commodore Consultants”, entered the competition in November. The first round of competition involved receiving generic materials on the holding company Alphabet, synthesizing its most critical issues, and creating strategic recommendations for the business. 63 teams competed in this first round and, based on their deliverable, the Commodore Consultants were one of 15 teams invited to the finals in Vancouver. In Vancouver, the students received another set of case materials, this time on a Canadian food delivery startup, for which they conducted similar analysis as the first round. All competitors were graded by a panel of judges from firms like Accenture, Deloitte, and McKinsey & Company on their content and presentation. The Commodores advanced to the semi-final round. Through this experiential learning opportunity, the team learned a great deal about cooperation, qualitative and quantitative research, and creative thinking. Additionally, the team enjoyed the opportunity to engage with students from international cultures and with unique perspectives. In the future, the team hopes that more groups of Commodores will have the chance to take advantage of similar opportunities with NSCC and other organizations.